Seattle audiences have the opportunity to hear some of the world’s most renowned conductors and soloists on the Seattle Symphony’s 2016–2017 season. 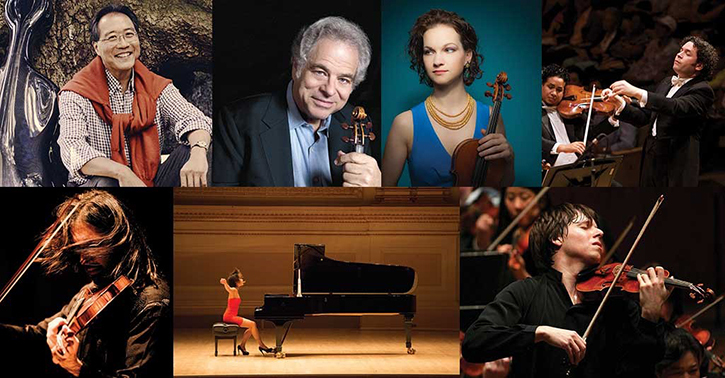 The star-studded lineup of soloists includes cellist Yo-Yo Ma (October 14), conductor and violinist Itzhak Perlman (October 15 & 16), violinist Hilary Hahn (October 30 and February 9, 11 & 12), conductor Gustavo Dudamel and the Los Angeles Philharmonic (November 4), violinist Leonidas Kavakos and pianist Yuja Wang (February 10) and violinist Joshua Bell (February 17 & 18). Concerts with Yo-Yo Ma and Itzhak Perlman this week are nearly sold out, but there are still opportunities remaining to hear the other soloists and conductors coming to Seattle this year. Hilary Hahn approaches the violin recital with the same clarity and refinement that sets her apart as a concerto soloist. From the bedrock of Bach to brand-new commissions, Hahn’s compelling programs and brilliant interpretations reinvigorate the violin repertoire. The Los Angeles Philharmonic, under the leadership of Music & Artistic Director Gustavo Dudamel, comes to Benaroya Hall for a one-night-only concert event featuring Mahler’s deeply personal Ninth Symphony, his final completed masterpiece. Bruch's popular and technically difficult Violin Concerto No. 1 is in good hands with violinist Hilary Hahn, the Seattle Symphony’s featured artist for the 2016–2017 season. Two extraordinary stars unite for a scintillating evening of duets, including Schubert’s variations on a moving love song. Enjoy the sensitive interplay of violin and piano in alluring sonatas from Debussy and Bartók, one ephemeral and the other earthy. Beloved violinist Joshua Bell shines on Tchaikovsky’s heroic Violin Concerto. Dvořák’s uplifting Eighth Symphony evokes the simple, peaceful atmosphere of his Bohemian homeland. Take a seat to a great season of music! Tickets are going fast and can be purchased online or by calling 206.215.4747. Tickets may also be purchased through the Seattle Symphony’s Listen Boldly app for iPhone and Android.